Such beauty, such detail—get in touch with the artist in you. Taught by our Master fruit carver— Kru Kingtian. Come learn from her how to master the techniques and become as good as you can be. Here’s just a sampling of what you can learn to do. All it takes is a great instructor, some talent, and lots of practice! **SPECIAL** 3,800 Baht for beginner classes!! Unless you are an experienced fruit carver, we recommend you start out with the basics. Courses 1-4 will get you lots of practice to develop the right moves. Once you have completed these classes, you will be ready for the more advanced instruction that we also offer. How long you actually take to complete these classes depends entirely on how fast and talented you are. PURPOSE: Teaching of fruit carving methods and techniques, proper use of fruit carving tools, selection of fruit for quality, care of fruit after carving. Classes are listed in order of difficulty. For novices, we recommend starting with Class #1. Making of leaves, flowers, and petals are easiest when starting with Course #1. 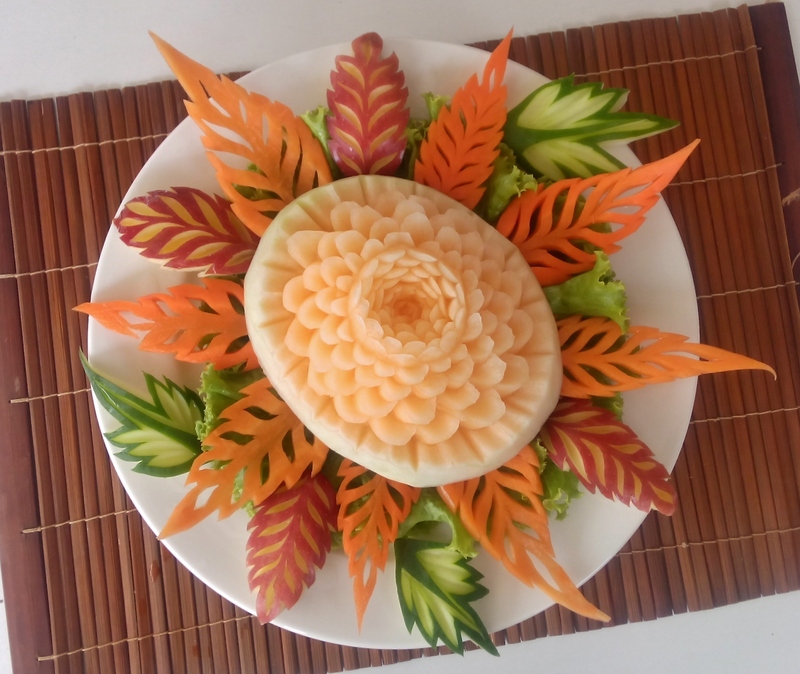 NOTE: Fruit carving is an ART, not a science. The more you practice, the more you will learn and the more proficient you will become. 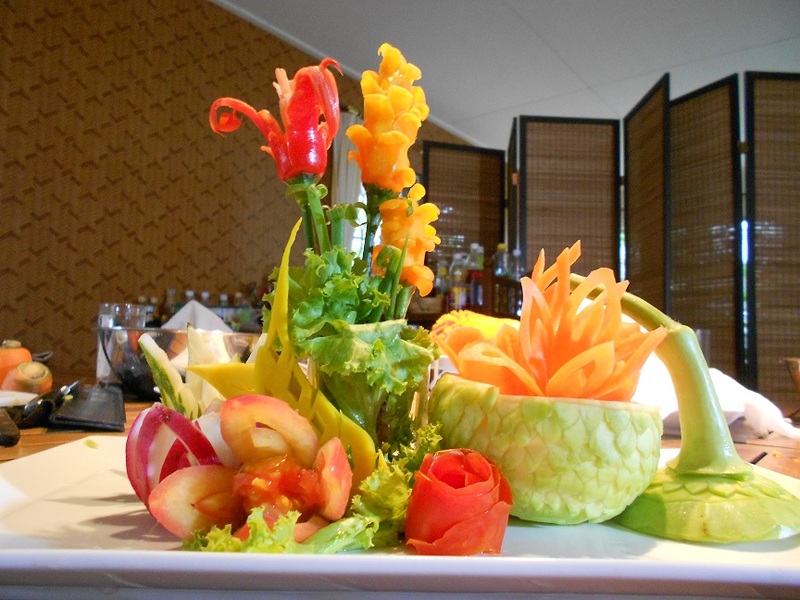 For those really serious about fruit carving, we offer as many classes as you wish to take. For those who are already skilled in fruit carving, please refer to our Advanced Classes section below. For those already skilled in this art form, we offer advanced training. We have no predesigned classes here, as instruction will be dictated by your own interests and proficiency. Our goal here is to take you to the next level. When BOOKING for these classes, please provide details to us in the “Comments” area as to what you wish to learn and your general skills level. We will be glad to design a learning program for you, one which will improve your skills. 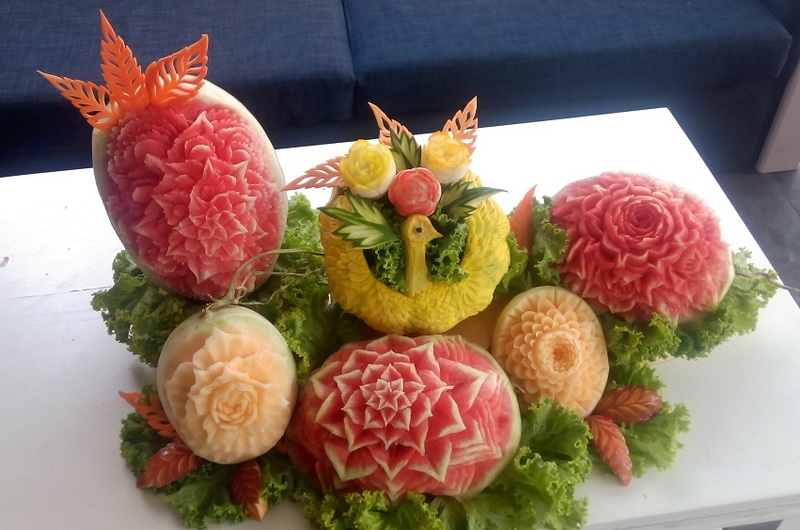 If you wish to send us pictures of your fruit carving creations, please send to Brian@PhuketThaiCookingAcademy.com. Our instructors will review and reply to your email with a class plan, etc. *Free pick up and drop off provided for guests in Patong Beach, Karon Beach, Kathu, and Phuket Town. Free transportation is provided for group sizes of three or more anywhere on the island. Additional charges for smaller groups may apply; contact us for details. 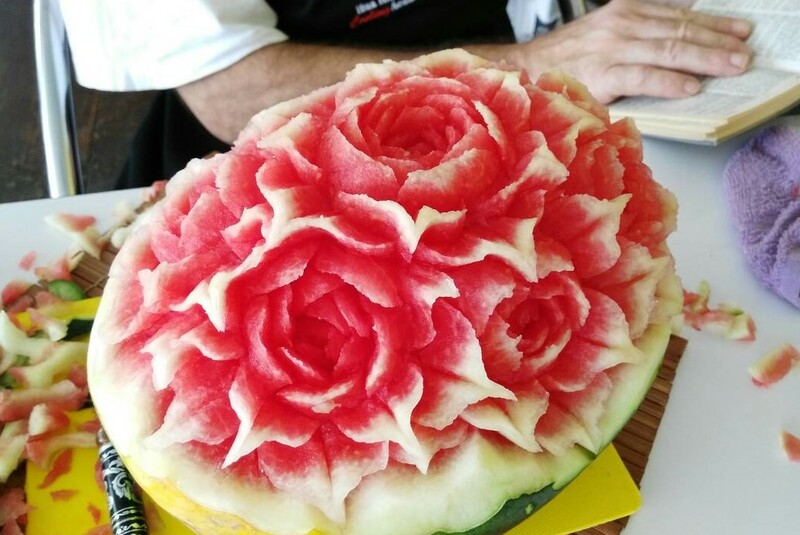 BOOKING & PAYMENT: When booking a fruit carving class, please use our “BOOKING” page, and indicate “Fruit Carving” class. Please indicate in the “Comments” section whether you are a beginner or advanced. If you do not indicate this, we will start you at the Beginner level. We will confirm the availability of your requested class. The amount due is to be paid in Thai Baht upon the completion of your first class. SNACKS & BREAKS: There will be a 15 minute break during each class. Snacks along with coffee, tea, or water will be available (free). SCHEDULING FLEXIBILITY: Pick the class(es) you want to learn and the day(s) you wish to take them. Classes are available Monday-Sunday. We will confirm with you shortly after receiving your booking. CERTIFICATE OF ACHIEVEMENT: A Certificate of Achievement is provided to those completing 1 or more fruit carving classes. We are in Phuket, the home of Kae Sa Luk. Join us and learn from our Masters!